Tom Taps Speak is specifically designed, in collaboration with parents and speech therapists, to help people with communication impairments. 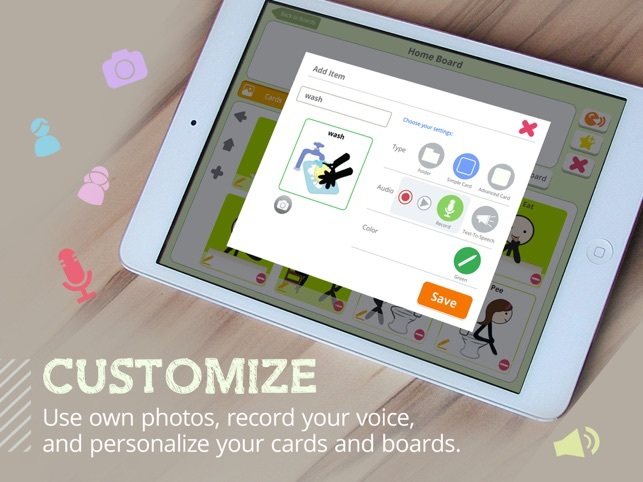 It is picture-based and has a friendly text-to-speech function. It was lovingly conceived by a father to help his son, who was diagnosed with autism, to communicate with the people around him. 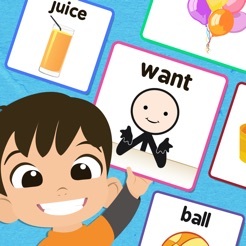 Communication Tool - Express yourself with Tom Taps Speak AAC app with hundreds of vivid and colourful picture cards all organised in twenty-four categories like People, Actions, Feelings and so much more! Customise - Use our ready-made pictures from the Archive or your photos from your own iPad’s Gallery. Record your voice for a more personalised feel. 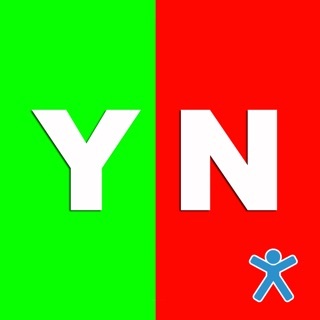 Favourite Mode - Save your long and most-used phrases and sentences and sort them to your convenience. 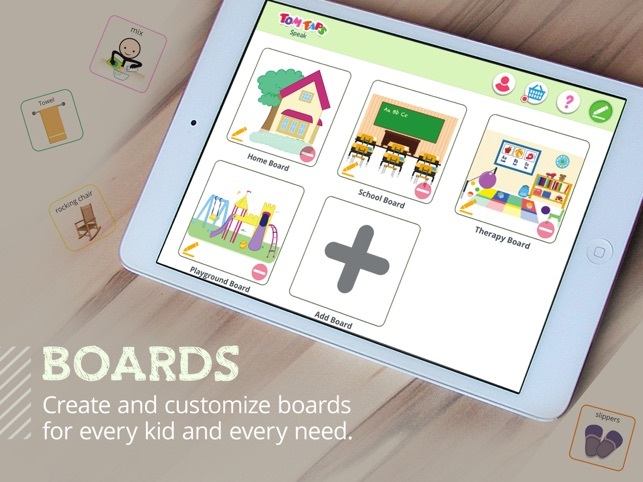 Boards - Make your own communication board that can cater to different people and different needs. One board can be for Tom, the other can be all about Shapes or Colours. 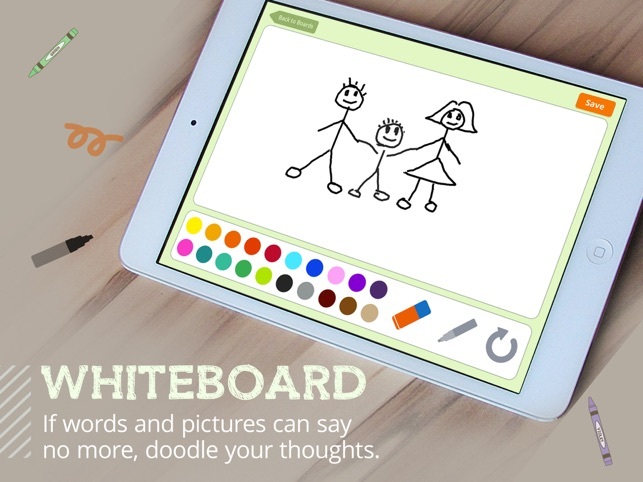 Whiteboard - If words and pictures can say no more, doodle your thoughts! You can save them in your Gallery or find them in your Communication Tool’s Sentence Composer. Keyboard - Say it with letters. 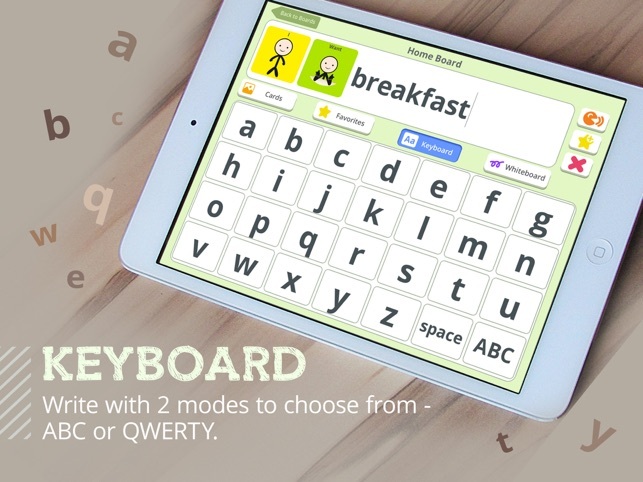 The Keyboard can be arranged either in an alphabetical format or in the QWERTY format! Your words can mix with picture cards for better expression. Store - Unlock useful features and access more pictures you can use for card-making like Kitchen, Living Room, Bathroom and Bedroom picture sets. Support - Contact us for questions and feedback for additional support besides our Help Manual. 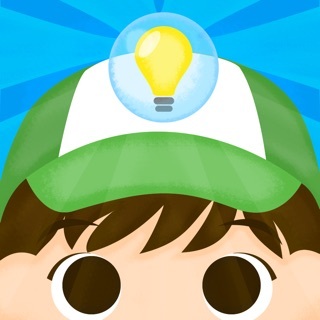 Visit tomtaps.com to know more about our advocacies in bridging people through our learning apps. My boy has autism. He is four and somewhat verbal but extremely hard to understand. He gets so frustrated. This app has been great for giving him a way to tell me what he wants. I payed the extra money to be able to customize boards and it even lets you add pictures, which is awesome for adding his favorite toys and foods. This app has a nice basic starter page. I wanted to add some specific items, so I went ahead and paid to be able to customize it. It was very easy to customize and easy to put my own pictures in. 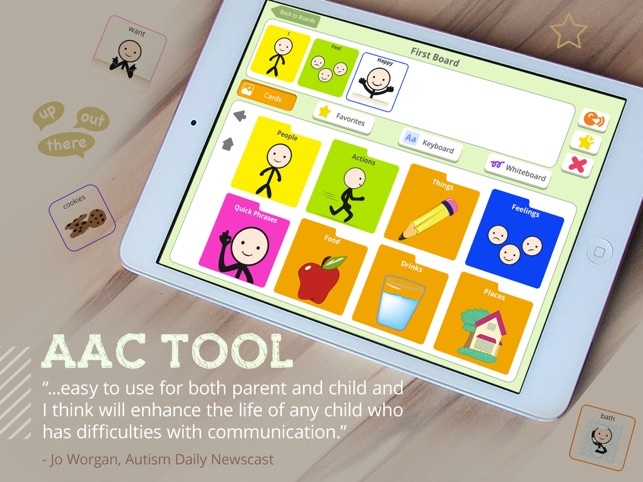 I recommend this for a simple AAC device or to help a young child learning to communicate. I don't doubt that it is a good app but I should not have to pay to get a keyboard.